Will a new generation foils transform the way that PVC-U is sold in 2019? We’re now into second, in some cases third-time replacements. The still astoundingly popular PVC-U window may be a little bit more energy efficient, a little bit more secure, a little more green, but there is still – at the very least in the way that it is perceived by the end-user – little immediately tangible to distinguish first, second and third generation product. The exception is in aesthetics. Finish, appearance and styling are the battleground on which the competition for the second and third-time replacement markets are being fought, lost and won. “PVC-U product still accounts for more than 80% of the market in the UK. That’s 80% of the more than 6.82million window frames supplied each year”, says Ian Cocken, Director of Sales and Marketing, aluplast. According to Palmer, at the latest 167 million window frames in the home improvement sector have been replaced at least once i.e. 92.1% of the total stock. Palmer’s forecast is that this will rise so that by 2020, 95% of windows in owner occupied dwellings will have been replaced at least once. According to Palmer demand for foils including both woodgrains and solid colours has jumped by 45% since 2013. Aluplast for its part has invested heavily in its colour and finish offer. Non-standard foil colours. For example, are supplied within 15 working days or less. This flexibility is built around the investment that aluplast has made in CNC foiling technology. This eliminates the time lost in traditional foiling in manual set-up and switch over, cutting it from hours to just minutes. It is, however, Woodec, the company’s new generation PVC-U foil that aluplast argues has the potential to transform the PVC-U window and door market. 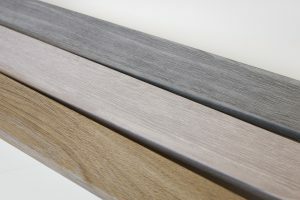 Launched at its global conference held in Cardiff last autumn, this includes three ultra-life-like woodgrains: Turner Oak Malt, a subtle light oak finish; Sheffield Oak Alpine, a silvered oak finish; and slightly darker, Sheffield Oak Concrete. “The realism is exceptional. 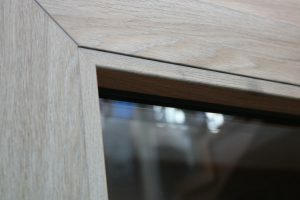 When you look at it on a frame it’s almost impossible to distinguish it from a timber product. Woodec is on a completely different level to traditional foils”, says Cocken. Woodec is available across the German system house’s core Ideal 70 and contemporary Ideal 4000 system, plus its new Smart-Slide inline sliding door and Flush Casement Sash and Lift-and-Slide Patio. 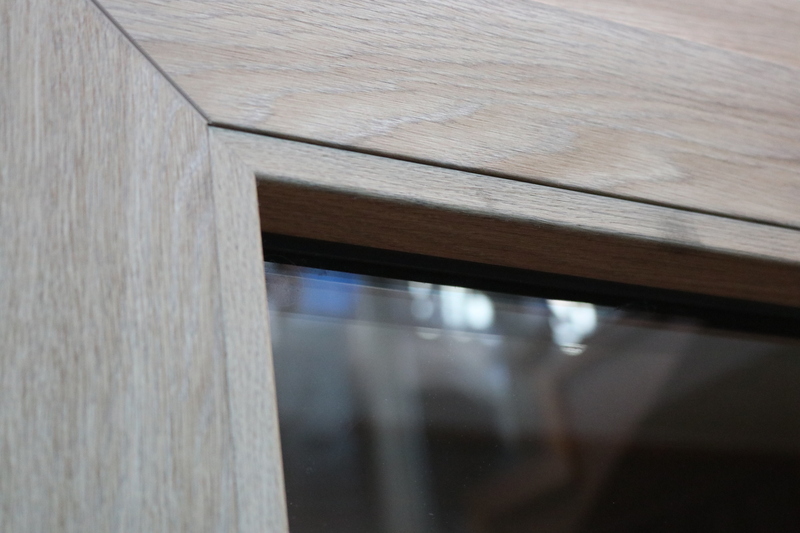 Developed to offer ultra-slim sightlines with a low chamfer running out to the IGU, aluplast’s Flush Casement, also launched at Cardiff in autumn 2018 has been developed to integrate fully with both the established aluplast Ideal 70 and Ideal 4000 systems. Separately, the Smart-Slide inline sliding door is a new mid-market PVC-U inline sliding door capable of spanning openings of 5.85m wide by up to 2.5M high. The 70mm system has also been developed to deliver significant efficiencies in fabrication and exceptional through life performance. The Ideal 4000 window, the aluplast Lift-and-Slide and its new Smart-Slide Inline Sliding Door, in addition to standard foils and woodec, are also available in aluskin, aluplast’s highly innovative aluminium click-and-fix external fascia system. This proven system emulates the appearance of aluminium, while delivering higher u-values at significantly lower cost. “Our investment in the past two or three years has been exceptional. That’s providing UK fabricators and installers access to a very competitive offer, which delivers multiple USPs, while is underpinned by the resource of a global systems leader”, says Cocken. “Woodec is very much a part of that narrative, delivering a genuine step change in foiling technologies.